If you are looking for natural ways to dye your hair black then henna and indigo combination is the best choice. Henna dyes the hair red and indigo dyes the hair blue so when applied together, they dye the hair black. 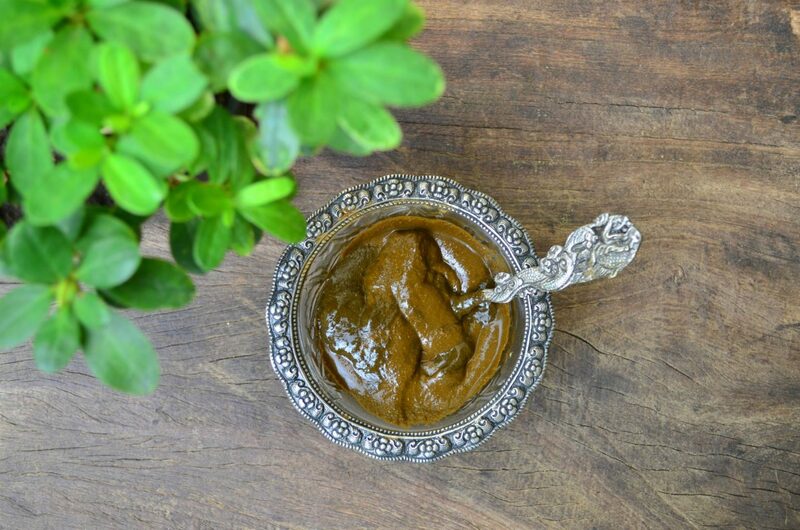 There are two ways to apply henna and indigo, the first method is a single step process of soaking henna powder over night and then adding indigo powder paste to it in the morning and applying it together. The second method is a two step process of applying henna paste one day and indigo paste the next day. You can choose either one method depending on the color you want to dye your hair. What Is Indigo Hair Dye? 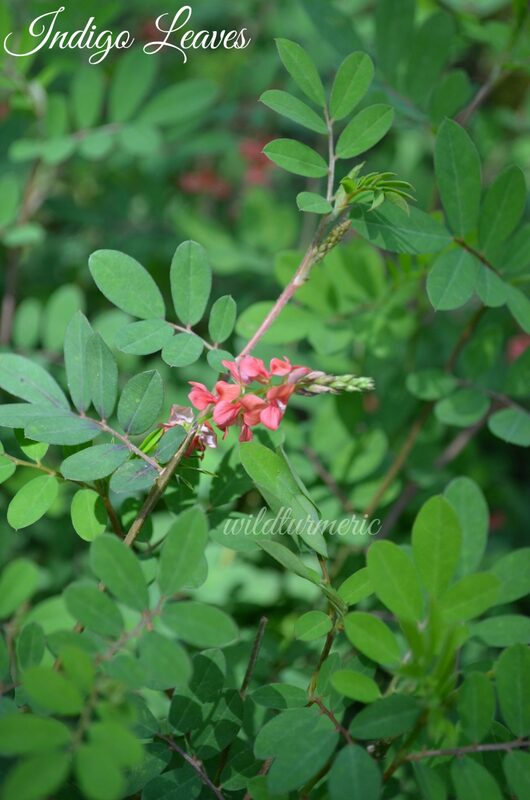 Indigo hair dye is a natural dye got from Indigo plant whose botanical name is Indigofera Tinctoria. When leaves of indigo plant undergo fermentation, it releases it’s blue dye. For making indigo hair dye, indigo leaves are processed, sun dried and powdered to a smooth powder. When mixed with water, indigo powder releases blue dye. Indigo when applied on the hair not only dyes the hair, it has amazing hair benefits too. It promotes hair growth, treats scalp infections and has been in use for thousands of years. You can read about it in detail here. Henna also called Mehndi in India is also a natural hair dye obtained from henna plant. Henna leaves releases it’s red dye when the leaves are ground with water. We can use either the fresh leaves or dried leaf powder as a hair dye. For making the henna hair dye, fresh henna leaves are collected, sun dried till crisp till there is no moisture left and then powdered finely. Like Indigo, henna also has amazing hair benefits. Here in our village, we use henna extensively for hair care. We make hair oil with it, we use it in hair packs and also we use it to dye hair. 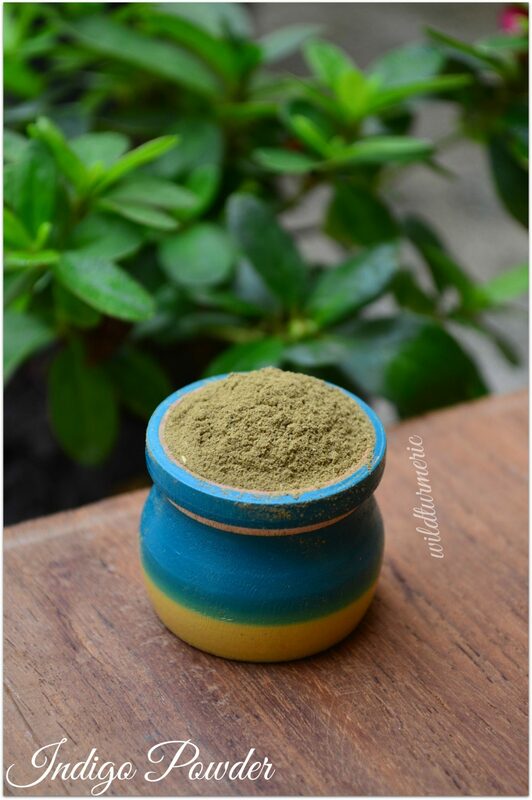 We mostly use fresh henna leaves but the pure dried powder also has amazing hair benefits. It strengthens and conditions the hair along with promoting hair growth. Like I have mentioned before henna and indigo dye made with pure natural organic powders not only helps in dyeing the hair, it helps greatly with hair growth too. Whereas chemical dyes causes skin and scalp allergies and also is the leading cause for melasma as chemical hair dyes increases skin sensitivity to sun. I agree that indigo hair dye can be more time consuming to use compared to chemical hair dyes but considering the amazing hair benefits and the side effects of chemical hair dyes, I would confidently say it is worth the time. For doing the one step process, take 1/4 cup of henna powder in a bowl. 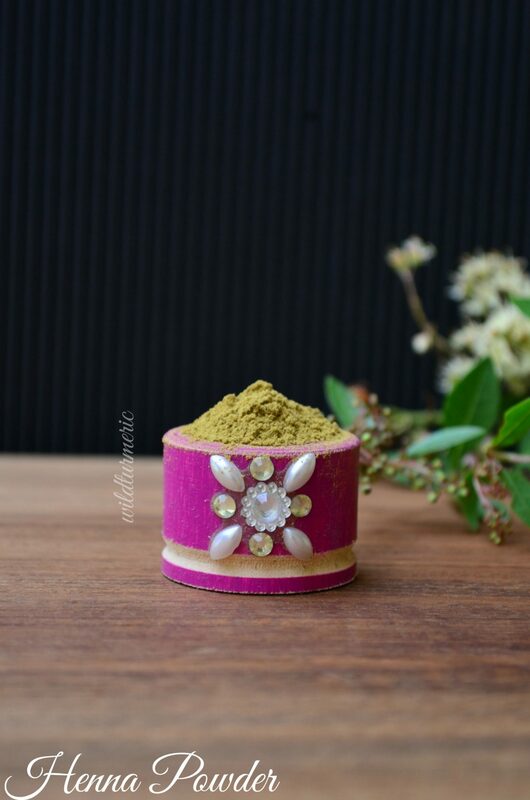 Usually 40 to 50 grams of henna powder will be enough for close cropped hair, 70 to 80 grams will be enough for shoulder length hair and around 150 grams will be necessary for long thick hair. You can also try add-ons like apple cider vinegar and lemon juice along with black tea, each ingredient will change the color of the hair lightly. I would suggest first using just black tea and once you are comfortable, you can use ingredients like apple cider vinegar and lemon juice and finally settle on the blend that you like. Let henna mixture sit overnight covered with a plastic wrap. The next day, henna paste would have changed color and would have released the red dye. You will able to see reddish tint around the edges. Mix well to get a smooth paste. Take equal amount of indigo powder in a non metallic cup as it is best not to use metallic containers while mixing dyes, I usually use glass containers. Using equal amounts of henna powder and indigo powder will result in black color. If you want reddish brown hair color, use 2 part henna powder and 1 part indigo powder to make the dye. Now add a big pinch of salt to indigo powder, this will help indigo powder release the blue color faster. Now add warm water to indigo powder and mix to form a smooth paste without any lumps. I would suggest using a whisk to mix the ingredients, it will ensure we get a smooth paste. Let it rest for 30 minutes. After the resting time, you will find blue tinges at the corners. This indicates that indigo powder has released it’s dye and is ready for hair dyeing. Now add the indigo paste to the henna paste and mix well till they are combined well together. Usually any additions like yogurt or coconut milk or oil will inhibit dyeing so I would suggest not using it. But if your hair is very dry, you can add just a tsp of coconut milk or yogurt or any unrefined oil of your choice to the mixture before applying but use only a tiny bit. Also before applying make sure your hair is not oily. Apply little bit of coconut oil to your hair line to prevent skin from staining. Always make sure to wear gloves if you don’t want any stains on your hands. Wear an old dress while applying henna to prevent stains and drape yourself with an old towel. If the paste is too thick it will be hard to apply and if it is too thin, it will be dripping all over you so make sure to mix it right. Once you have applied the paste, take the left over henna indigo paste and apply it all over your head, this will ensure that every part of the head is covered with the dye. Cover your head with shower cap and let it sit for 5 to 6 hours. Some people might get a headache if they leave this paste on their hair for long, for them I would suggest adding few drops of eucalyptus essential oil to the mixture. After 5 to 6 hours, wash your hair with plain water. Don’t use shampoo, use shampoo only after 48 hours. It might take some time to remove all of the henna indigo paste from your hair but rinse it off completely and dry your hair. 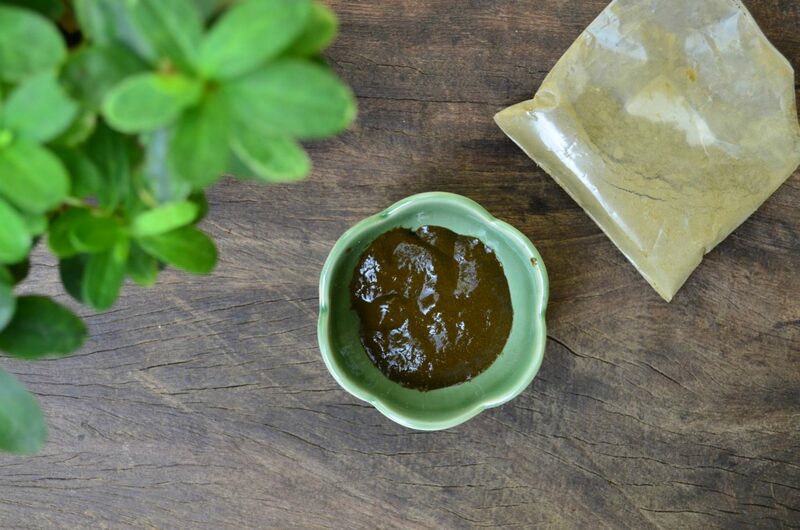 With the 2 step process, you will be applying henna powder separately and indigo dye separately. The two step process is more time consuming (usually double the time) as you have to apply both the dyes separately on your hair and leave it on for few hours each time. The first method is suitable for people who have few strands of grey hair which they want to dye it either black or brown. But if you have lot of grey hair and need to dye it black, I would suggest using this method as it gives better results. Though in the first try you don’t get dark black color, with subsequent use, your hair will turn black. Add the juice of 1 lemon to henna powder. Now add enough water mix to form a smooth paste without any lumps. Let it sit in an iron kadai overnight. This will help us get a dark color. The next day, the paste would have darkened and would have released the dye. Now mix well and apply to clean dry hair. Follow all the steps mentioned for application in the one step process. 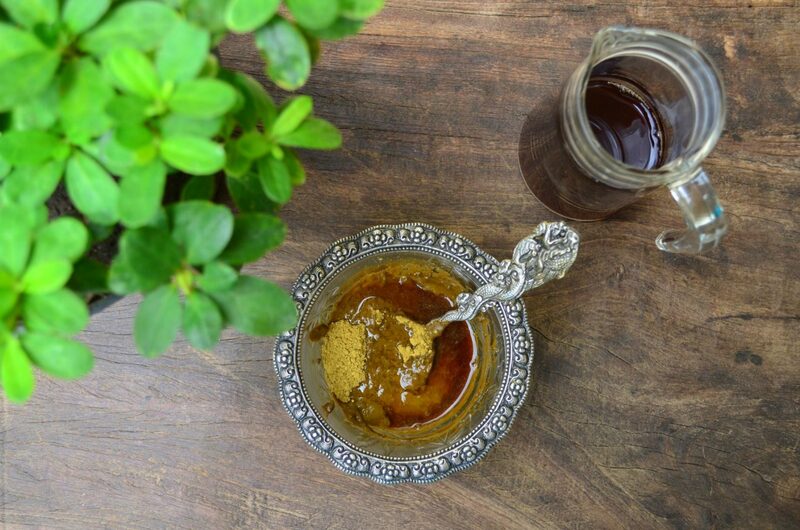 After 4 to 5 hours, wash the henna paste out of the hair using just plain water. 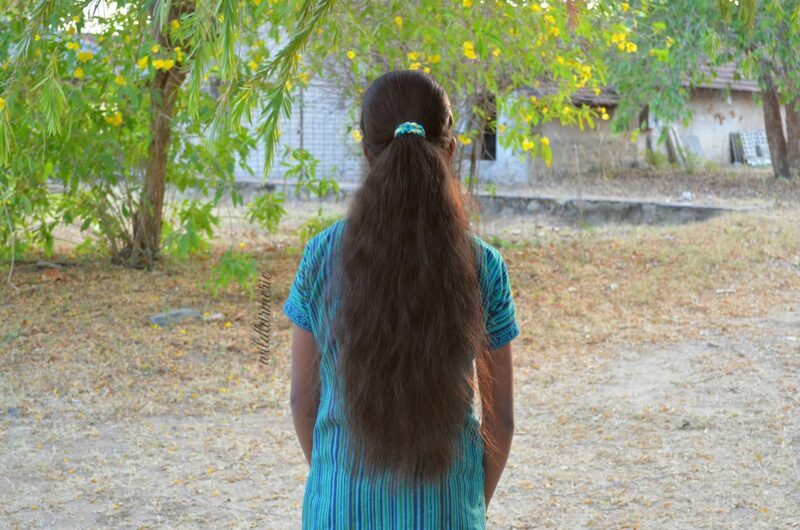 Washing henna paste out of the hair will take time especially if you have long thick hair. Don’t use shampoo to wash out the henna. Now take required amount of indigo powder enough to cover your hair in a non metallic cup. Now add warm water to indigo powder and mix to form a smooth paste without any lumps. Let it rest for 30 minutes for the powder to release the dye and apply indigo dye all over the hair after washing off henna. Cover with a shower cap and leave it on for 2 to 3 hours and wash it off using plain water. Dry your hair naturally, if you are using this process for the first time, you will find that your hair is not completely black. Continue using this dye and it will turn black with subsequent use. Indigo powder will be easier to wash off the hair when compared to henna powder. Don’t use shampoo for the next 48 hours to fix the dye in your hair. Where To Buy Henna & Indigo Dyes? We get indigo powder and henna powder separately in the markets, you can buy them separately for making the dye. Some companies also pack both indigo and henna powders together but separately in individual packs so it is easy for 2 step process. If you don’t want to buy the powders separately, I would suggest buying from companies that sell them together but in individual packs. Finally we get indigo and henna premixes, in my personal opinion I would suggest buying the powders either separately or in packs not as a premix. Don’t buy cheap indigo and henna powders as they might contain harmful chemicals that can cause harm to our hair. Usually if you do the 2 step process, it will take almost a day so be prepared for that. If you don’t have that much time, I would suggest doing it on two days. Please remember that your hair will be red on the day you apply henna. So plan accordingly, choose a day when you won’t go out to apply henna. Though you can add in ingredients like egg and coconut milk to henna mixture to condition the hair, all these ingredients inhibit dyeing process. I would suggest adding only a tsp of unrefined oil of your choice to the mixture. What a great post. I individually sell both henna and indigo powder. So delighted to see you talk about the same here, it helps people to learn about natural methods to dye their hair. How many days once I want to use these mam ? It depends on how much grey hair you have. For very small hair coverage, you can use it monthly once but if you have lot of grey hair, use it every 15 days. Once you start using this hair dye regularly, you will find that you can increase time between applications…. in the US we use a different measurement system, things are measured by 1/4th a cup, 1/2 a cup etc. In India I always read in cookbooks they measure by the weight which is probably more accurate. However, how are you doing this? Do you have a special scale and you weigh the weight each time on the scale? Mam Which brand indigo and henna powder u suggest? ?